SUMMIT, NJ — Unlike many notable private art collections that serve the public good only after they have been donated to a museum (or turned into museums of their own), the Mott-Warsh Collection was conceived to fulfill a larger social purpose. Fifteen years ago, Maryanne Mott and her late husband, Herman Warsh, set out to make a difference in her community of origin, Flint, Michigan, by facilitating meaningful engagement with art. Troubled by the steady decline of art education in public school systems across the United States and noticing the lack of art by people of color in many of the nation’s fine art museums, they decided to establish a collection of art by artists of the African diaspora and others who reflect on it. This approach to the democratic dissemination of art looks back to the Roosevelt-era Works Progress Administration, which employed artists to decorate post offices and schools during the Great Depression, and forward to the institutional critique of elite culture that informs much art activity today. And it takes on an even greater urgency in light of the contamination of Flint’s water supply, an unprecedented public health crisis that burst into a national scandal late last year. The exhibition is a diverse assortment of art forms and imagery, a selection of 24 works from more than 600 by 183 artists in the collection. Sensitively organized and installed by Mary Birmingham, the Curator of the Visual Arts Center, the display meshes its disparate elements seamlessly, with paintings, photographs, drawings, prints, and mixed media from the past half-century constructing a narrative of dignified resistance in the face of intolerance. But there is also considerable conceptual variety underlying the works, many of which are ambiguous in terms of content and intention. From the evidence presented in Recharging the Image, the collection was assembled not as a series of teaching moments, but as works of art that can confound and challenge just as easily as they can enlighten and inspire. 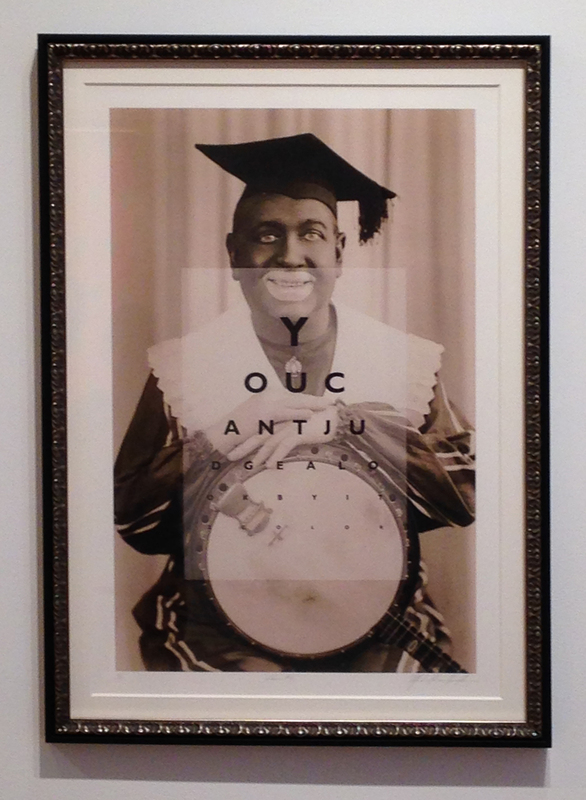 What is one to make of Mark Steven Greenfield’s “Lesson #3” (2004), a lithograph composed of a vintage portrait photograph depicting a grinning white minstrel player in blackface, complete with banjo, clown costume, and mortarboard perched jauntily on his head? Superimposed over the picture is an eye chart that reads “You can’t judge a look by its color.” Not exactly the kind of thing you would routinely hang in a public library, but it’s a testament to the level of trust that Mott and Warsh placed in their audience that they would acquire a work dealing with such an entrenched image of virulent bigotry. 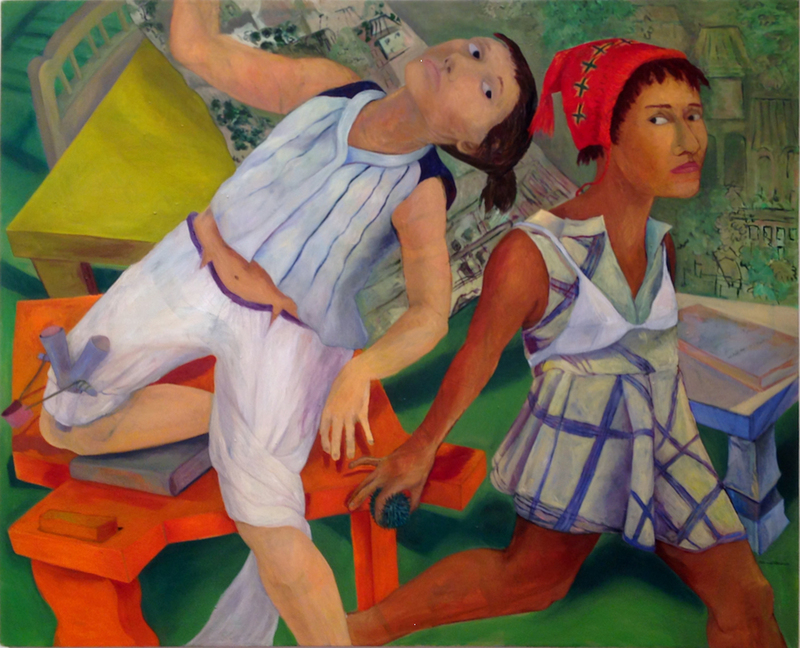 Another enigmatic piece is Philemona Williamson’s painting “Prickly Pear” (2002), in which two sexually ambiguous young people (both appear to be female by their hair styles, but the figure on the left is dressed boyishly, with a slingshot slipped inside a trouser fold, while the other wears a white bra on the outside of a summer dress and holds a prickly pear gingerly in her right hand. Heading in opposite directions, the two figures appear to be warily regarding one another while attempting to flee the scene. The backdrop, a jumble of brightly colored furniture against a green field, seems almost like a theatrical set and does nothing to clear things up, but the variation in skin tones, which makes the character on the left appear Caucasian while the other could be African-American or Hispanic, hints at racial animosity — the prickly pear that rasps at attempts to overcome social boundaries. More than half of the works on display are from the 21st century, but it is intriguing to compare two pieces hanging side-by-side that were made in the latter decades of the 20th, Romare Bearden’s “Mother and Child,” a highly stylized collage from 1969, whose nobility is offset by the Rococo playfulness of Nefertiti Goodman’s “Getting Fixed to Look Pretty” (1978), a large, white-on-black linocut. 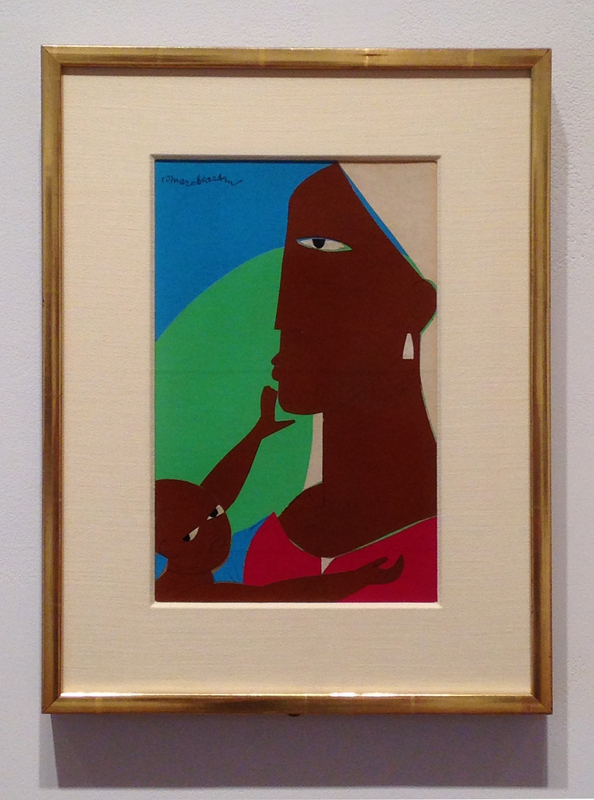 The mother in Bearden’s collage is rendered in profile with the clean, stark geometry of a Dan or Senufo mask from the Ivory Coast, a demigoddess possessing the gravity of an Egyptian hieroglyph or Russian icon. 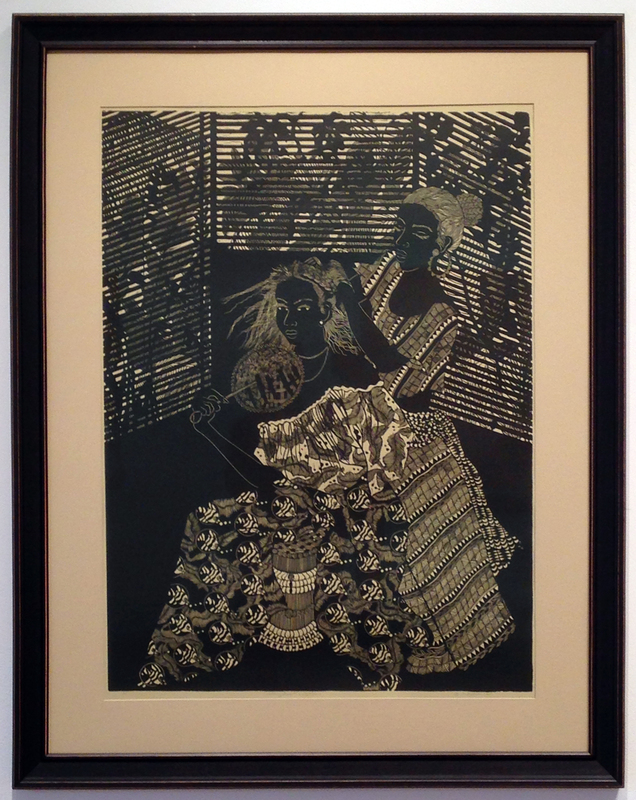 Goodman, in contrast, depicts two women, one fixing the other’s hair, dressed in elaborately patterned gowns against an equally ornate backdrop of broad-leafed plants casting shadows on the slats of Venetian blinds. There is a reversal of racial expectations in both. As Birmingham notes in her brochure essay, Bearden, with his “powerful representation of African-American motherhood,” quietly subverts the long history of European interpretations of the Madonna and Child, while Goodman’s print could be viewed as playing against the image of the black servant attending to a white woman, most notably in Edouard Manet’s “Olympia” of 1863. A connection to the time period that produced Manet’s iconic painting, the midpoint of the American Civil War, is suggested by the picture’s trappings of the antebellum South — hand fan, lush flora, floor-length gowns resembling hoop skirts — but by depicting both women as African-American, Goodman is turning our art historical assumptions back on us. Bearden’s collage was completed the year after the assassination of Martin Luther King, Jr., and that tragedy no doubt informed the stateliness of the image. The later work by Goodman, made during the relatively progressive Carter administration, offers a more complicated mix of themes for an increasingly complex time, a window of small gains that would give way to the coded racial language and outright fear-mongering that marked the campaigns of Ronald Reagan and, eight years later, George H. W. Bush. Robert Colescott painted “A Legend Dimly Told” in 1982, less than two years into Reagan’s first term. 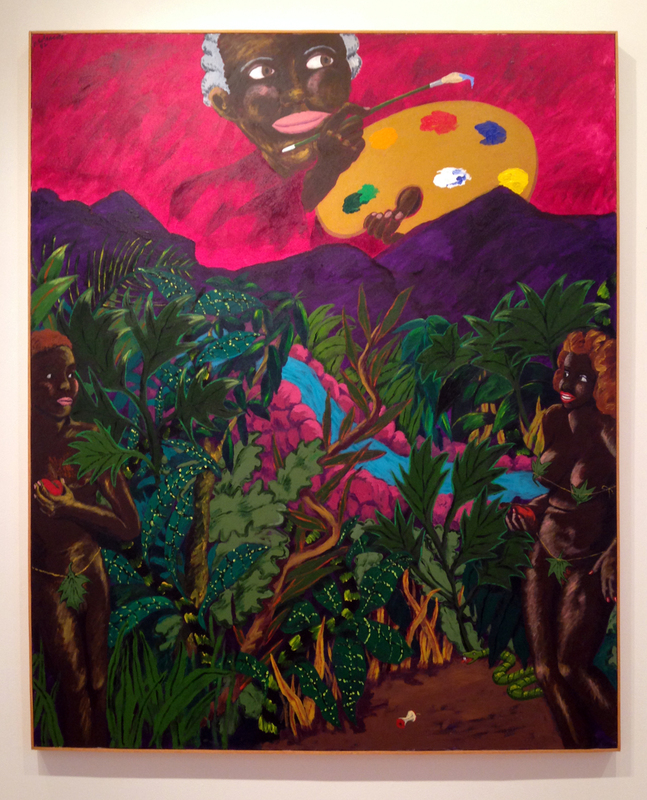 Colescott’s stock-in-trade was the skewering of racial stereotypes through politically trenchant satire, often using shockingly racist imagery long before Kara Walker, who is represented in the collection but not in the show (Colescott died in 2009 at the age of 83). His “Legend Dimly Told” appears to be that of Adam and Eve, who are wearing fig leaves in an electrically colored tropical paradise. Looming above them in the fiery alizarin sky, a grandfatherly God dabs a paintbrush onto a palette, the Creator as Divine Artist. All three characters are dark-skinned with faces verging on caricature. What’s intriguing about Colescott’s adaption of such familiar iconography is that, as indicated by the fig leaves as well as an apple core lying on the ground, the scene depicted takes place after the Fall — the moment when Adam and Eve ate from the tree of knowledge and learned right from wrong. But rather than flailing their limbs and gnashing their teeth, as they do in just about every other interpretation of the event, they appear no worse for the wear, and even seem to be enjoying themselves (Adam, in fact, holds another apple in his hand). God in his heaven doesn’t seem to care much either. It’s a refreshingly revisionist view of humankind’s innate corruption and culpability, painted at a time when Christian fundamentalism was sealing its grip on conservative politics. The African origins of modern humans have been a topic of speculation since Charles Darwin, but in a coincidence worth savoring, Colescott was at work on this picture just as genetic research was underway to identify modern humankind’s common ancestor through mitochondrial DNA, which ultimately led to a woman who lived 100,000 to 200,000 years ago in East Africa. (The evocative term “African Eve,” however, wouldn’t be coined until 1987.) Be that as it may, Colescott’s painting makes for a buoyant riff on a story usually intended as a guilt-inducing downer, symbolically undermining the moral authority of those who would incorporate it into an apparatus for social control. 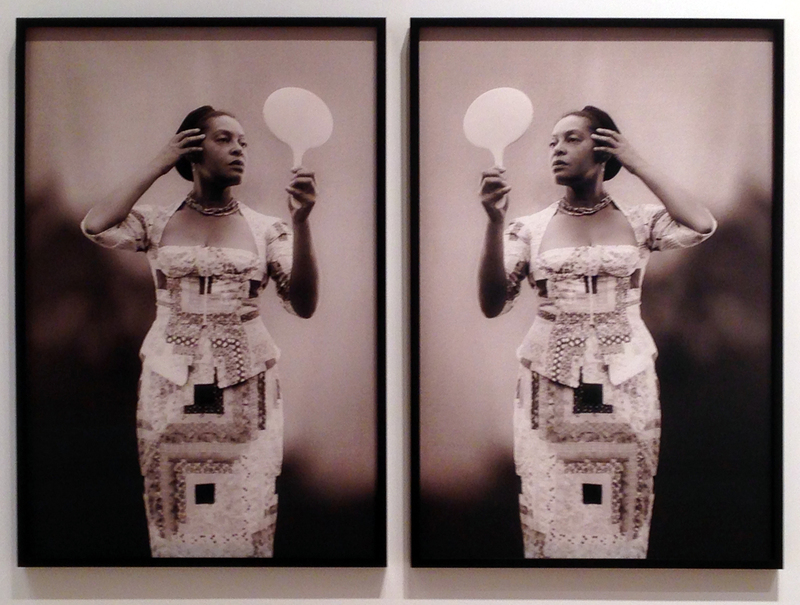 A similarly ironic subversiveness infuses Carrie Mae Weems’s diptych, “I Looked and Looked but Failed to See What So Terrified You (Louisiana Project series)” (2003), which hangs on the wall opposite Mark Steven Greenfield’s “Lesson #3.” Like the image of the minstrel player in that piece, “I Looked and Looked” also features what appears to be a vintage portrait photograph, but Weems’s work is actually a mirrored self-portrait that’s been filtered to look antique. Decked out in an elaborate evening dress, the artist primps in a handheld mirror as if on her way to a Harlem Renaissance salon. As she stares intently at her own face, you can all but hear the piece’s title running through her head. 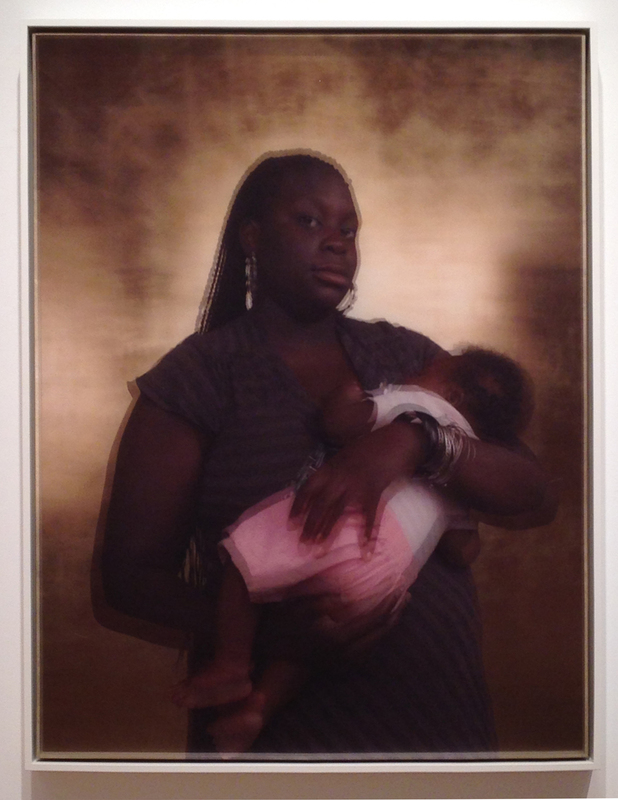 Actual audio is part of “Bearing (Shaquanna)” (2006) by Bradley McCallum and Jacqueline Tarry, in which a photograph of a mother and child — identically printed on two sheets of translucent silk, one in front of the other, so that the focus shifts eerily as you move past it — is accompanied by a set of headphones transmitting a narration by the portrait’s subject, Shaquanna, as she relates the travails of becoming pregnant at 13 by an 18-year-old, who promptly departed. 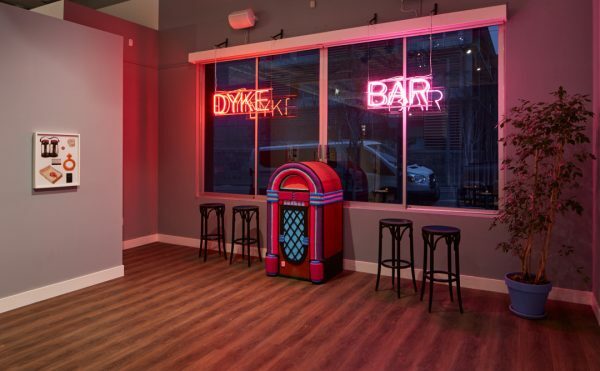 The installation makes for complementary readings across the space. Just as Weems’s vintage photo echoes Greenfield’s, McCallum and Tarry’s mother and child corresponds to Bearden’s on the opposite wall. Portraits abound, from a moving, heavily outlined 2002 etching of Martin Luther King, Jr., by John Wilson, to “Locks” (also 2002) by Diane Edison, a richly pigmented drawing in colored pencil of the back of a head covered in Medusan dreadlocks. There are also three works by Whitfield Lovell, two untitled drawings of faces, one from 2003 and the other from 2005, both with antique playing cards affixed to the lower portion of the paper (a two of hearts beneath an image of a woman and a ten of hearts under a man in a sailor’s cap). The third piece, “Face” (2006), is a charcoal portrait of a woman in a pearl necklace on a round piece of wood, with a shelf mounted below it. 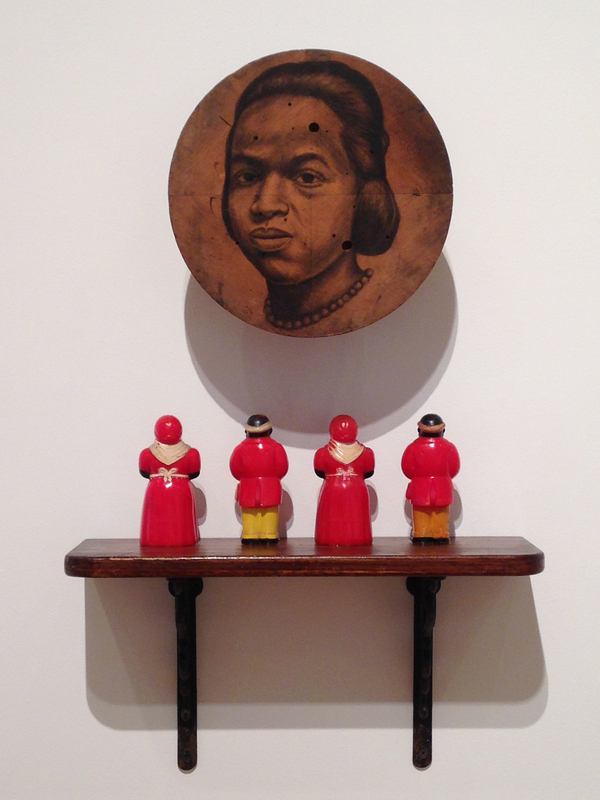 Lined up across the shelf are four figurines representing African-American stereotypes of household servants, but turned so that their backs face the viewer. Lovell derives his drawings from family photographs, and so there is an intimately familiar aspect to them — gazing at them can seem almost like a violation of privacy. Their antique look, however, can feel distanced, and the juxtaposition of handcrafted charcoal drawings and found objects often opens up a disconcerting conceptual space, a wedge of estrangement occupying the center of the work. Still, Lovell’s art holds an uncommon grip on the emotions. In “Face,” the disposition of the four figurines is especially unsettling. Turning one’s back is a sign of shame, anger, or resentment, as well as a form of punishment. Do they face the wall because the contrast between the dignity of the portrait and the cruelty of the kitsch would be nothing short of a sacrilege? Or because (one would hope) we have turned the page on that kind of demeaning iconography? Or are these figures simply waiting to be turned back around again? Using the simplest of formal means, the circle of the portrait and the rectangle of the shelf, Lovell spins a piece of personal history into a welter of contradictory meanings that touches upon communal histories, remembrances, and aspirations. It’s also compelling that, given their bright red coloration, the eye is drawn first to the figurines, an involuntary action mirroring the knee-jerk response that racial signifiers induce even among the best-intentioned — a moral failing genetically linked to the original sin of slavery, and another reminder, as if we needed one, of the long road left to travel. Recharging the Image: Selections form the Mott-Warsh Collection continues at the Visual Arts Center of New Jersey (68 Elm Street, Summit, New Jersey) through July 10.